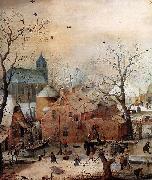 1585-1634 Dutch Hendrick Avercamp Galleries Hendrick Avercamp (bapt. 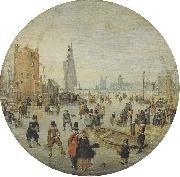 January 27, 1585, Amsterdam - buried May 15, 1634, Kampen (Overijssel)) was a Dutch painter. Avercamp studied in Amsterdam with the Danish-born portrait painter Pieter Isaacks (1569-1625), and perhaps also with David Vinckbooms. 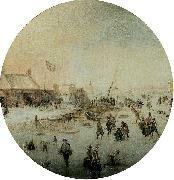 In 1608 he moved from Amsterdam to Kampen in the province of Overijssel. Avercamp was deaf and was known as "de Stomme van Kampen" (the mute of Kampen). 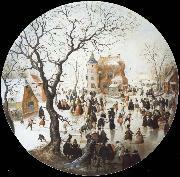 As one of the first landscape painters of the 17th-century Dutch school, he specialized in painting the Netherlands in winter. Avercamp's paintings are colorful and lively, with carefully crafted images of the people in the landscape. Avercamp's work enjoyed great popularity and he sold his drawings, many of which were tinted with water-color, as finished pictures to be pasted into the albums of collectors. Queen Elizabeth II has an outstanding collection of his works at Windsor Castle, England.